s/v Pelican - Following A Dream: Heading to Nassau Tomorrow! Chris here... 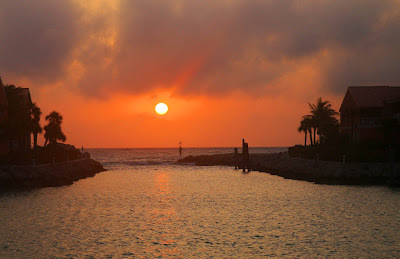 The sun is setting on our two week stint in Bimini. While we've enjoyed beautiful sunsets, like the one above from tonight, great Bimini Bread, nice people and a laid back attitude, we're happy to be moving on and to be heading further east. While Nassau doesn't really completely match what we are hoping to experience here, it is a great opportunity to meet up with Kristen's parents who are flying in tomorrow. Today was spent as all pre-passage days are - loading the dinghy (now with the lock removed), cleaning up the clutter inside in preparation for sailing, checking oil and coolant, plotting courses, checking equipment, etc. It was close to 90 degrees with 100% (or more) humidity, so it was lots of fun running around. I am soooooooo glad we got air conditioning on Pelican! If you click on the above chart, you can see our planned path across the Grand Bahama Banks. Yes, the depths are all in feet. The wind is predicted (not from Chris Parker - we'll hear his forecast in the morning) to be around 10kts from the north, moving to east and then southeast on Tuesday. Because the wind will be moving toward our nose, we're probably going to sail through the night to try to reach Nassau on Tuesday morning. If the wind cooperates enough, I'm hoping to pull out our asymmetrical spinnaker (a huge colorful lightweight sail at the front of the boat). The only hairy part of the trip will be passing through the Northwest Channel during dark, but we've had numerous people tell us we should be OK. 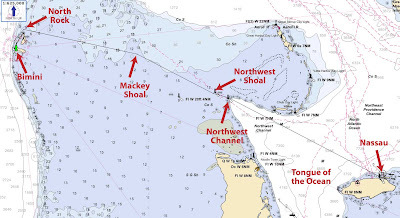 The channel is surrounded by rocks and shoals, half a mile to each side of the passage, so you have to be fairly accurate on your course. Anyway, we'll be running the SPOT as usual, so feel free to follow along! The link is to the right under "tracking". We'll talk to you when we get to Nassau!